The fountain, designed by George A. Frederick who also designed and built Baltimore’s City Hall, was the very first architectural element erected in Patterson Park in 1865. It was also one of the first restoration projects undertaken after years of neglect and vandalism left it dilapidated and inoperative. In 2003, the fountain was completely restored with assistance from a $100,000 grant from the TKF Foundation. The TKF Foundation funds parks and landscape projects that fulfill the goal of creating “open spaces” and “sacred places". The fountain is once again a gathering space for the community to socialize, as well as a spot to quietly enjoy the soothing sounds of the fountain’s cascading water. It is also the location of the Friends of Patterson Park’s annual Wine Tasting Fundraiser. The Patterson Park Swimming Pool is located at 148 S. Linwood Avenue. The Pool officially opens for the season annually in mid-June. Visit the Patterson Park Public Pool Facebook Page for more information, rules and hours. $30 for individual season pass; kids under 3 admitted FREE. The Patterson Park Boat Lake was created during grading operations in 1864 when extensive earth-moving work was performed to remove military emplacements and to fill ravines. When residents began using the lake as a skating pond in 1865, the Board of Public Park Commission authorized expansion of the lake to accommodate skating as well as boating. This work, completed in 1875, enlarged the Lake to its present size and included a brick retaining wall, an island, and plantings of trees and shrubs. A system of trench drains and earthen pipes to convey water to the lake was constructed to eliminate wet areas in the park. Water from the marble fountain at the Lombard Street entrance and numerous springs and seeps were also piped to the lake. By 1884, a boat landing shelter was added. By 1897, the growth of vegetation in the lake was sufficient to preclude boating. In 1984, the Departments of Public Works and Recreation and Parks drained the Boat Lake to remove sediment and deepen the lake. In 2003, a restoration of the Patterson Park Boat Lake was completed under the direction of the Department of Recreation & Parks. The project included dredging of the lake, environmental signage, and wetland planting. The original brick wall along the Lake’s perimeter, as well as the island, remain. Today, the Lake is a combination of open water and a wetland habitat for fish, waterfowl, and songbirds. The Boat Lake is enjoyed by many for fishing, wildlife viewing, and educational programming. Pavilions can be reserved for family picnics or similar events. Visit the Baltimore City Department of Recreation and Parks website for detailed information on obtaining permits to use the pavilions. Patterson Park has two playgrounds. The first, located inside the park near the intersection of Linwood Avenue and East Pratt Street, features swings for infants and big kids, and two play areas for a range of ages. The second, the "Castle" playground, is located near Eastern Avenue between Milton and Montford Avenues. Constructed in 2005, this playground pays homage to the Baltimore’s distinct architecture and landmarks - complete with rowhouse facades, a Bromo-Seltzer clock tower and a gazebo reminiscent of the Music Pavilion, one of Patterson Park’s lost landmarks. The space is completely fenced-in and includes separate play spaces for toddlers and older children plus an open area for running or tossing a ball. The slides and climbing equipment connect into the wall, making them handicap accessible. The Virginia S. Baker Recreation Center, constructed in 1974, is a hub of activity with a year-round schedule of programs. The Recreation Center is located inside the park at 2601 E. Baltimore Street (near Luzerne and Baltimore). The center includes a large multi-purpose room, gymnasium, game room, meeting room, kitchen, and computer lab. Activities have included Salsa classes, Yoga, Volleyball, Karate, Zumba, Cooking classes, Youth Basketball, Pinata making and much more. Please call 410-396-9156 or visit their website for more information on a current schedule of activities. Now known as the Casino, this building was designed by Charles H. Latrobe and built by Cornelius Sheehan in 1893. At the time it served as a new focal point for the expanded park. First used as a refreshment stand, it has served a number of purposes over the years including a park office with basement tool house, an upper story suite of residential apartments and public rest rooms. It now houses an adult day care center run by Baltimore City’s Department of Aging. The Patterson Park Dog Park is located south of the tennis courts on Linwood Avenue and features two fenced-in spaces for dogs to run. For more information about the Dog Park, rules, and how you can get involved, visit the Patterson Dog Park Association's Facebook page. The known as the Pagoda because of its oriental architectural appearance, the design was intended to reflect the bold Victorian style of the day. From the top of the tower one can view downtown, Baltimore’s many neighborhoods, the Patapsco River, the Key Bridge and Fort McHenry. Over time and due to natural decay, vandalism, and lack of maintenance funds, the Pagoda was closed to the public in 1951 when the first of a series of partial renovations was attempted. At one point demolition was proposed as an option but thankfully the 1998 Master Plan for Patterson Park called for the complete restoration of the Pagoda. This project was guided by the Friends of Patterson Park, in partnership with Baltimore City’s Department of Recreation and Parks and MANY neighborhood volunteers. 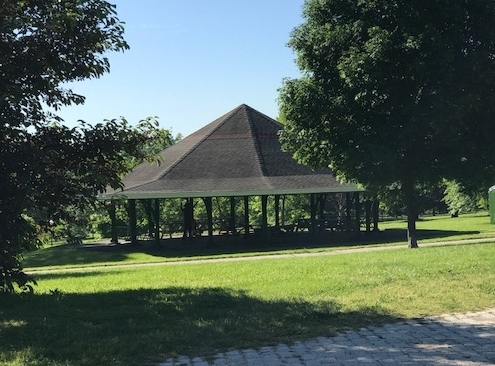 Completed in the spring of 2002, the Pagoda now stands as an iconic structure for Patterson Park and Baltimore City and signified the renaissance of the community around Patterson Park. It is also the location of many programs and events, such as the Friends of Patterson Park Summer Concerts Series, Audubon’s family programs, Tour Dem Parks waterstop, one of the sites of AVAM’s Kinetic Sculpture Race obstacles, The Friends’ annual Moonlight Pagoda event and much, much more! The Pagoda is operated, maintained and staffed by The Friends of Patterson Park and volunteers. The Pagoda is open 12 noon to 6 pm on Sundays from mid-April through mid-October. Dominic “Mimi” DiPietro Family Skating Center, located at 200 S. Linwood Avenue, is a popular center of activity for cold weather activities. The rink features public ice skating sessions, ice hockey, broomball, and sled hockey from October until late March. The rink also hosts many of Baltimore’s hockey teams, as well as seasonal special events. The Dominic “Mimi” DiPietro Family Ice Skating Rink was originally built in 1967 and is named after the late, longtime East Baltimore City Councilman. In 1986 the rink was enclosed with a tension structure and the changing/warming house was expanded. The rink is full-sized measuring 200 by 85 feet and is equipped with a warm-up room, fireplace, concession stand and skate shop, which makes this facility the perfect venue for private parties and group rentals. For more information on sessions/hours, contact the rink directly at 410-396-9392 or follow them on Facebook. 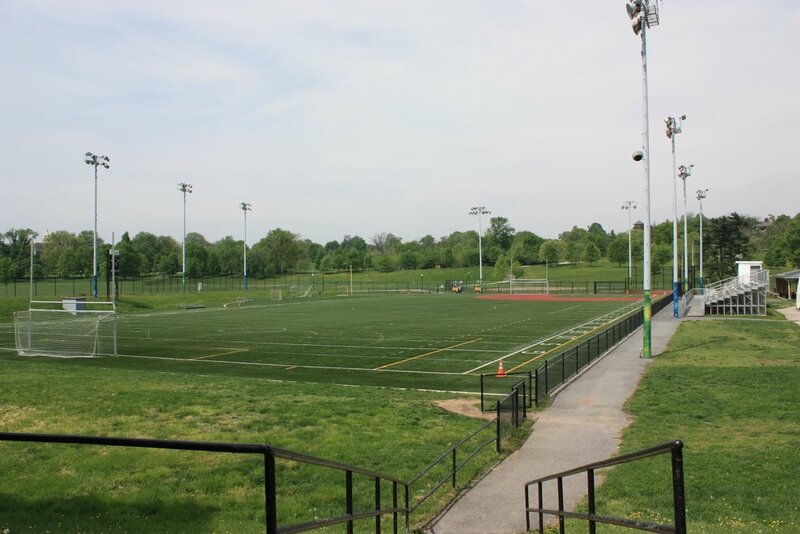 In 1970, a new football field was built in Patterson Park and dedicated as Utz Field after Utz Twardowicz, Director of the Highlandtown Red Shield Boys Club from 1948 to 1969. The Patterson Park Youth Sports and Education Center includes a new, multi-purpose, turf field located on Utz Field and includes an educational building that houses classrooms for activities and programming year-round. Programming includes academic support, physical education and activity, nutrition education, provision of healthy snacks, and anti-gang and drug prevention workshops. Contact pattersonparkinfo@gmail.com or call 410.878.0563 for more for more information about ongoing programs. For many residents, rowhouse living does not allow much green space to grow flowers and produce, work the soil, or just relax. Fortunately for city gardeners, the Department of Recreation and Parks’ Horticulture Division maintains 7 community gardens around the City. Patterson Park is home to one of these gardens known as Patterson City Farms Garden.